I must remember this July twilight of absolute contentment, the stroll from our vegetable garden uphill, lush beet greens cradled in my arm. Must never forget the four eggs resting in the moat of the hens’ water feeder hanging from my other hand. Our menopausal girls labor awful hard to provide our protein. Granny comes to mind, my childhood glimpse of her walking down her Appalachian alley, holding a limp chicken by its feet. She did all her butchering for our fried chicken by stealth—never saw her harm anything save flies, gnats, and roaches. I sit in my swing under breezy maple branches, watch lightning bugs and ponder my birthright. What on earth took me so long to grow my own food, to know such pleasure? To learn there’s healing in the leaves above? My grandmother understood that cure, read the Bible through many times—Deuteronomy 20:19, “for the tree of the field is man’s life.” I found the verse just last week and believe it wholeheartedly. Uncle Herm, one of Granny’s sons, appears with his brother Tab in my long processional of ancestral farmers. They’ve all played their part in leading me back to the land. Glory gleams in Uncle Herm’s eyes as he walks from his garden, buckets full of sweet corn and beans. It’s the best feeling in the world to walk in my uncles’ footsteps. 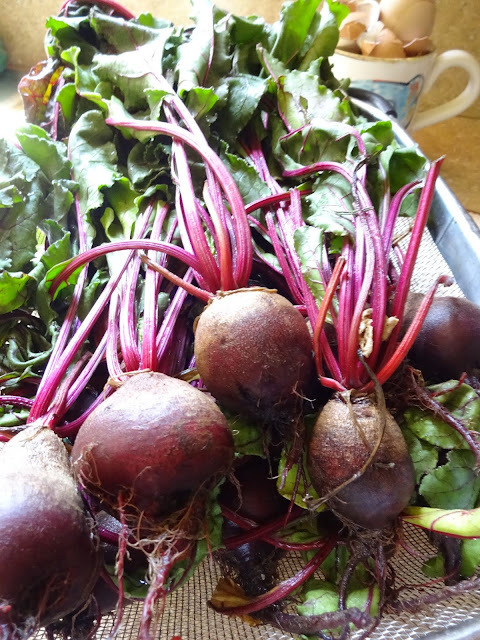 The scent of beets begs for my mother who often served them pickled, one of my favorite foods—according to my taste buds, the closest flavor to rich, composted earth. Mom would be tickled to see the hole in the left knee of my favorite garden jeans. Thistles, mulch, and grit consumed the cloth and exposed my skin to living microbes from the likes of decomposed sheep and chicken dung. Nematodes, scientists call them, organic bacteria dark enough to stain my skin as they did my mother’s, grandmother’s, great-grandmother’s—ages way back to Eve. I still hear the vulnerable love in her voice, an intimacy with food she dared share with a large group of writers she did not know. Her words quicken my inheritance with the spirit of my ancestors, encourage me to persist with growing and preserving the fruit of my land with labor of my hands. Dear Reader, as Eve entered her bower, I step into my dark kitchen, the end of another magnificent, productive day. I remember this Paradise is the birthright of all her children. If we do not forfeit this promise for another place, we will know the pleasure of our Maker’s birthmark upon our bended knee.